Grant, we beseech thee, O Almighty God, that thy faithful, who rejoice under the name and protection of the most blessed Virgin Mary, may, by her pious intercession, be delivered from all evils on earth, and be brought to the eternal joys of heaven. Through our Lord Jesus Christ, thy Son, who liveth and reigneth with thee, in the unity of the Holy Ghost, God, world without end. Amen. Invocation of the Name of Mary – 25 days’ Indulgence, each time. The Sovereign Pontiff, Clement XIII, by a decree of the S. Congr. of Indulgences, Sept. 5, 1759, confirmed anew the following indulgence, already granted by Sixtus V and Benedict XIII, to all those who devoutly invoke the name of Mary. AN INDULGENCE OF TWENTY-FIVE DAYS, each time. And the Virgin’s name was Mary. (St. Luke, i. 27) Let us speak a little about this name, which signifies star of the sea, and which so well befits the Virgin Mother. Rightly is she likened to a star: for as a star emits its ray without being dimmed so the Virgin brought forth her Son without receiving any injury; the ray takes nought from the brightness of the star, nor the Son from His Mother’s integrity. This is the noble star risen out of Jacob, whose ray illumines the whole world, whose splendour shines in the heavens, penetrates the abyss, and, traversing the whole earth, gives warmth rather to souls than to bodies, cherishing virtues, withering vices. Mary, I say, is that bright and incomparable star, whom we need to see raised above this vast sea, shining by her merits, and giving us light by her example. Oh! whosoever thou art that seest thyself, amid the tides of this world, tossed about by storms and tempests rather than walking on the land, turn not thine eyes away from the shining of this star if thou wouldst not be overwhelmed by the hurricane. If squalls of temptations arise, or thou fall upon the rocks of tribulation, look to the star, call upon Mary. If thou art tossed by the waves of pride or ambition, detraction or envy, look to the star, call upon Mary. If anger or avarice or the desires of the flesh dash against the ship of thy soul, turn thine eyes towards Mary. If, troubled by the enormity of thy crimes, ashamed of thy guilty conscience, terrified by dread of the judgment, thou beginnest to sink into the gulf of sadness or the abyss of despair, think of Mary. In dangers, in anguish, in doubt, think of Mary, call upon Mary. Let her be ever on thy lips, ever in thy heart; and the better to obtain the help of her prayers, imitate the example of her life. Following her, thou strayest not; invoking her, thou despairest not; thinking of her, thou wanderest not; upheld by her, thou fallest not; shielded by her, thou fearest not; guided by her, thou growest not weary; favoured by her, thou reachest the goal. And thus dost thou experience in thyself how good is that saying: And the Virgin’s name was Mary. OUR LADY: such is the title which befits her in every way, as that of OUR LORD beseems her Son; it is the doctrinal basis of that worship of hyperdulia which belongs to her alone. She is below her Son, whom she adores as we do; but above all God’s servants, both angels and men, inasmuch as she is His Mother. At the name of Jesus every knee is bent; at the name of Mary every head is bowed. And although the former is the only name whereby we may be saved; yet, as the Son can never be separated from His Mother, heaven unites their two names in its hymns of praise, earth in its confidence, hell in its fear and hatred. It was therefore in the order of divine Providence that devotion to the most holy name of Mary should spread simultaneously with the cultus of the adorable name of Jesus, of which St. Bernadin of Siena was the apostle in the fifteenth century. In 1513 the Church of Cuenca in Spain was the first to celebrate, with the approbation of the holy See, a special feast in honour of the name of Mary, while the Franciscan Order had not yet succeeded in obtaining a like privilege for the adorable name of Jesus. The reason of this is that the memory of that sacred name included in the feast of the Circumcision, seemed to the prudence of the Pontiffs to suffice. From the same motive we find the feast of the most holy name of Mary extended to the universal Church in the year 1683, and that of the most holy name of Jesus not until 1721. Our Lady justifies her beautiful title by partaking in the warlike exploits of the King of kings her Son. The city of Vienna having been delivered by her, contrary to all hope, from the power of the Crescent, the venerable Innocent XI made this feast the memorial of universal gratitude to the liberatrix of the west. But we shall speak more explicitly of this glorious deliverance on September 12, the day on which it occurred. This festival was appointed by Pope Innocent XI, that on it the faithful may be called upon in a particular manner to recommend to God, through the intercession of the Blessed Virgin, the necessities of his church, and to return him thanks for his gracious protection and numberless mercies. What gave occasion to the institution of this feast was a solemn thanks giving for the relief of Vienna, when it was besieged by the Turks, in 1683. If we desire to deprecate the divine anger, justly provoked by our sins, with our prayers, we must join the tears of sincere compunction, and a perfect conversion of our manners. This is the first grace we must always beg of God, that he would bring us to the dispositions of condign penance. Our supplications for the divine mercies, and our thanksgivings for benefits received will only thus be rendered acceptable. By no other means can we deserve the Blessing of God, or be recommended to it by the patronage of his holy mother. To the invocation of Jesus it is a pious and wholesome practice to join our application to the Virgin Mary, that, through her intercession, we may more easily and more abundantly obtain the effects of our petitions. 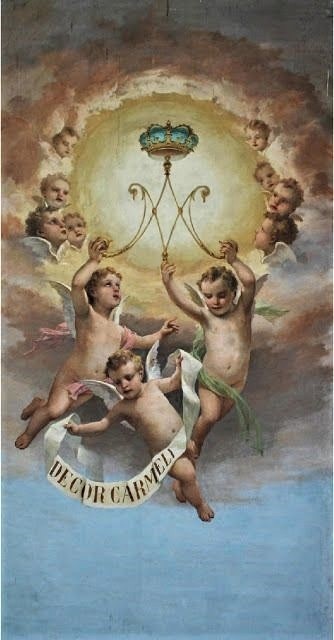 In this sense devout souls pronounce, with great affection and confidence, the holy names of Jesus and Mary. O sweet, O safe is that death which is accompanied and protected by so saying a name; for God only grants the grace of invoking it to those whom He is about to save.